An introduction to three historic battles in which the Marine Corps played a pivotal role. "In my generation, this was not the first occasion when the strong had attacked the weak… Communism was acting in Korea just as Hitler, Mussolini, and the Japanese had acted ten, fifteen, and twenty years earlier. I felt certain that if South Korea was allowed to fall, Communist leaders would be emboldened to override nations closer to our own shores." On 25 June 1950, The Democratic People’s Republic of Korea (DPRK), North Korea, supported by the Union of Soviet Socialist Republics (USSR) and the People’s Republic of China (PRC) invaded the sovereign territory of the Republic of Korea (ROK), South Korea by crossing the 38th parallel. Later that day, the United Nations Security Council (UNSC) condemned North Korean aggression by issuing UN Security Council Resolution 82. The resolution directed the immediate withdrawal of North Korean troops from South Korean territory. The resolution was passed by a vote of 9 for, 0 against, 1 abstaining and 1 absentee. The supporting votes were from the United States, United Kingdom, Republic of China (Taiwan), France, Cuba, Ecuador, Egypt, Norway, and India, with Yugoslavia abstaining. The USSR was absent since they were boycotting the UNSC at that time. Two days later the UNSC issued Resolution 83. The resolution “Recommends that the Members of the United Nations furnish such assistance to the Republic of Korea as may be necessary to repel the armed attack and to restore international peace and security in the area.” This resolution laid the groundwork for UN intervention into the Korean Conflict. Through surprise and speed the DPRK troops rapidly advanced south into ROK territory and capture the capital of Seoul on 28 June 1950. The North Koreans continued their advance south until ROK troops were bolstered by UN forces in July. During July and August, UN forces established a perimeter of 140 miles around the port city of Pusan in South eastern Korea. 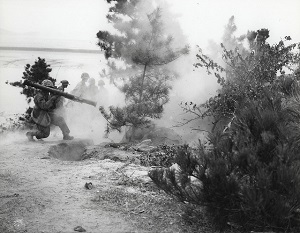 On 2 August 1950, the 1st Provisional Marine Brigade, “the Fire Brigade” landed in the port of Pusan and the Marine Corps began its involvement in the Korean Conflict. This conflict would see a growth of the Marine Corps from 74,279 to 249,219 Marines (Active and Reserve). The conflict would also see the Marine Corps suffer over 30,000 casualties, and 42 Marines would be awarded our Nation’s highest award, the Medal of Honor. 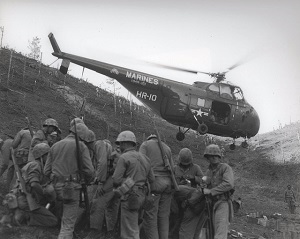 The Korean War solidified the Marine Corps role within the United States military and cemented its reputation as America’s elite fighting force in readiness. the brunt of the Chinese entry into the war. 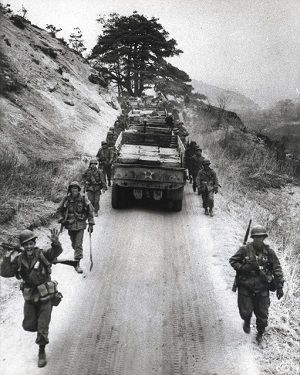 The “Marines in the Korean War Commemorative Series” of publications by the Marine Corps History Division provide the backbone of this information and are excellent references to begin your PME studies. You'll find them on the “Recommended Reading” tab, along with other books and articles that provide an overview and context for the Korean Conflict. Supplementing this knowledge is a collection of historical photographs, speeches, and maps that can enhance your understanding of the Korean War and the Cold War atmosphere in which America and its allies fought to prevent the spread of communism throughout the globe. On August 17, 1952, at the Hook near Panmunjom, North Korea, Private First Class Robert Simanek, already injured by an exploding grenade, rolled himself on top of a second grenade thrown into his trench to save the lives of his fellow Marines. On October 27, 1953, Simanek was awarded the Medal of Honor by President Eisenhower.